I booked my holiday online with onthebeach.co.uk to stay at the Levante Club Apartments, I chose here because the apartments looked great with air con, entertainment and a kids club as I was taking my 7 year old son on his first holiday. However when I arrived at 2am, I was told the apartments were over booked and they moved to another apartment which was a few streets away, when I went to the other apartment it was very old with no air con, no entertainment and no kids club. To be honest the whole apartment block was a complete dump....I have NEVER stayed in a worse place in my life, it was full of stag and hen parties who drank and smoked the whole time round the pool taking over the kids area and my son couldn't even get into the pool. The whole experience was awful, I have tried to contact onthebeach.co.uk to complain but surprise surprise I can't seem to get them, I would just like to warn everyone NEVER EVER book with this company as far as I'm concerned they are real con artists. These apartments turn into a place for lager louts swearing and drinking from Friday to Monday. We couldn't take the children anywhere near the pool or outside eating area from morning till night. The swearing was from the gutter. The staff are great and will do anything for you its not there fault that stag party's and hen party's behave in such a manner. If they put a stop to such party's using the hotel I would gladly go back until then I will not use the Halley again. Before my booking I did read a few negative reviews about these apartments so I had some nagging doubts prior to my arrival. On arrival I found the apartments looking very dated on the outside,with the pool area looking very neglected. At reception I was checked in with the minimum of fuss by a fairly pleasant guy (60 euro deposit)and made my way to my room on the 6th floor. On entering my first impression was that the place was screaming out for re-decoration. It was clean enough but the decor/furniture looked as if it hadn't changed in 20 years ! As we were on a weeks stag do we spent very little time there. During that time there were no changes of towels or bedclothes. We never used the kitchen for cooking thankfully as the utensils and cooker seemed very grubby. As we got the apartment for a very reasonable price it probably did the job for us. If you can get these apartments for a super price then go ahead but remember it is no palace. But as long as you dont set your sights too high, you may just get away with a visit here. Have just spent a week with friends at the Halley apartments and will never use them again. When we arrived our room was not clean. It smelt musty and we had to go out to buy cleaning things to clean it ourselves. Never used the cooker as it was dirty. I have never been to an apartment where you had to boil a pan of water to have a drink. It was like being in dark ages so we went out to buy a kettle. By Wednesday we had to go and ask for clean towels as all week we never saw a cleaner so our bed sheets were not even changed all week. What was meant to be a restaurant was a storage room full of old junk was nowhere to get a drink and on checking out there is no lock up for your cases, so you have to sit with them at the main door as there is no safety in leaving them unattended. Found staff very unhelpful even when it came to a simple thing as asking for a taxi was told we had to go to main road had to walk down dimly lit side street will never stay here again overall very poor. We have stayed at the Halley on a few occasions now and always found it to be clean. The pool area is great and gets the sun all day. I wish the cafe/bar was open but there are plenty of eating places very close by. Staff on Reception have always been friendly and help out whenever they can. No entertainement in the apartments but who wants to stay there when you have all the pubs and clubs to visit. In Benidorm there is something for people of all ages. We are going back to Benidorm in November for a Hen Weekend but cannot get booked into the Halley as they do not take 2 night bookings. Stayed at Halley apartments for 2 weeks. Very good location beach and town centre 5 mins walk away. Apartments basic but clean if you stay here take a kettle or you will be boiling pans for your hot drinks. Really enjoyed our stay at these apartments. It is close enough to everything so you can walk most places but out of the way so it is not noisy. Supermarkets and smaller shops right round the corner so even though it is self catering, you don't have to carry shopping bags very far! Also has a pub on the corner beside it which does good pub grub so if you can't be bothered walking far for a hangover cure you'll be grand! The pool is lovely and clean and gets the sun for all of the day. Met some lovely folk round the pool and the staff were freindly as well. We had a late check out and while we couldn't keep the room on later than 11am, we did have use of a shower room and bathroom later that day and they let us keep our cases in the lobby. Would definately stay here again - have no complaints at all (although if the bar/restaurant area had been open it would have been even better). Plus it was so cheap! I recommend anyone considering a trip to Benidorm stay here. We only stayed at the apartmenets for 4 days as we were on my hen party. The rooms are very spacious and clean and excellent value for money. The only down side is that there is no air conditioning but this wouldn't stop me from staying there again I just bought a fan to keep me cool at night. The loacation of the apartments is ideal, only 5 minutes walk to the main bar area and not to noisey at night so you can still get a good nights sleep (if you get in early enough). The staff are very friendly but some do struggle with basic english there was no entertainment at the apartments but that didn't bother me as there was loads to do near by and I wasn't in the apartments at night. 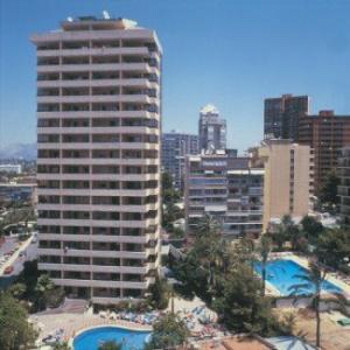 We stayed in the Halley apartments, Lavante Beach in Benidorm. Very nice and clean and spacious. Large balconies. Nice clean pool and a bar and food if required. Close to all ameneties and local english bars and restaurants. Only one complaint really about the lifts, they are very small, two people and some cases fills them. They broke down twice and we had to walk up to the 16th floor in searing heat. Apart from that I am booking again for next year.